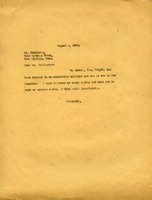 Martha Berry writes to Dr. Tomlinson that her sister has been injured in an automobile accident and needs another carboy of Tate water. 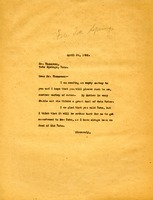 Letter to Dr. Thomoson from Martha Berry informing him that she is sending an empty carboy so that he can fill it up with Tate Water because her mother, Frances Rhea Berry, is very feeble and thinks a great deal of Tate Water. 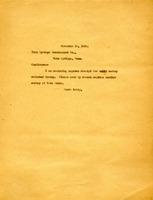 Miss Berry informs him that she is glad that he sold Tate but that it will be hard for her to get used to New Tate as she was so fond of Old Tate.